PCA has undertaken many projects and activities since it first started in 2002. The projects described briefly here are placed in reverse order, with the more recent work first and the oldest projects last. 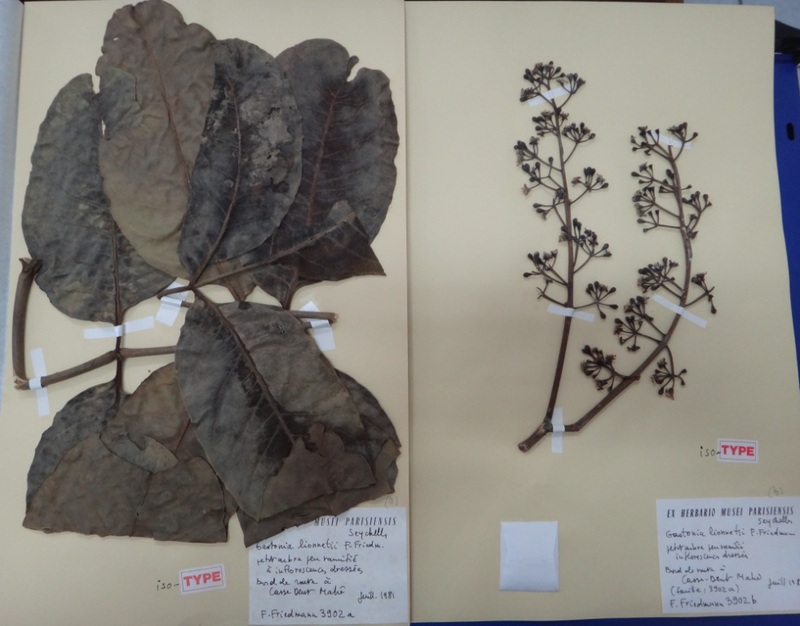 PCA members, including those working at the Seychelles National Herbarium, ran a two-week training course in plant identification. The course was mainly for non-botanists and non-scientists. 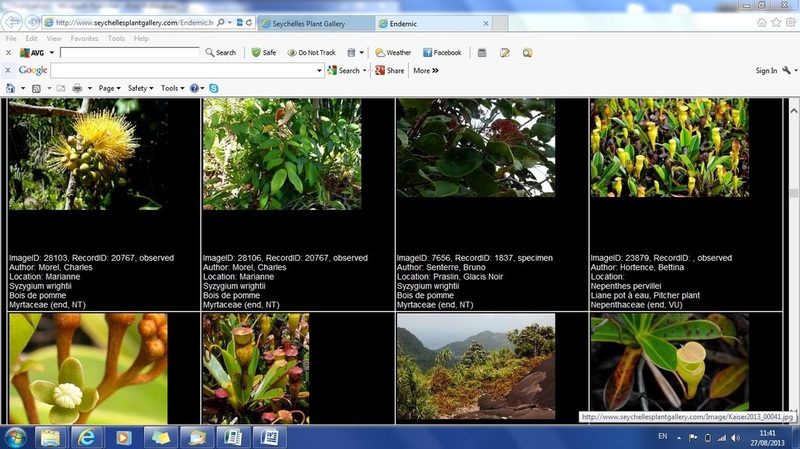 It familiarised the 20 participants with native and alien (introduced) plant species found in Seychelles. There were many field trips, giving participants an opportunity to learn about the plants in many different habitats - from lowland to upland mist forest, and from marshes to extensive boulder areas. As Mahe island is mountainous, the course also gave some people a way to lose a few kilos! The training formed part of the Seychelles 'Ecosystem-Based Adaptation to climate change’ (EBA) project, funded and implemented by the GoS-GEF-UNDP. 1. Rehabilitation of a small but important forest area, plus upgrading the path system of the forest nature trail and the main garden. 2. Improving the signage in the garden and the interpretive materials available for visitors. This included providing new information about the plants in the garden and also developing a small environment museum. PCA and Jardin du Roi received a grant from the Global Environment Facility (GEF) to help with this project. Rehabilitation is truly a long-term process and maintenance work has been held up by shortages of personnel. Sustainability for Seychelles (S4S) asked PCA to carry out a survey of the small freshwater wetland at this five start resort and spa on Mahe as part of a collaborative project between S4S and the resort. The small freshwater marsh had been invaded by floating alien species and also sections of the edges, although there were some lovely coastal trees present also. A report was prepared with advice for restoring and managing the wetland. PCA surveyed the beach crest vegetation of six important turtle nesting beaches in south Mahe for the Marine Conservation Society of Seychelles; and also gave recommendations for the management of this coastal vegetation at the six sites. PCA worked with Sustainability for Seychelles (S4S) and other NGOs to help the prison become more sustainable and to provide information and training to assist in skills development. Plants are an important part of the prison environment, both in the surroundings and the extensive farm. A native plant nursery was planned so that native plants can be used in landscaping and as part of an agro-forestry demonstration area. Improving farming practices proved to be an important form of training. It was also planned that the women create a medicinal plant garden as well as provide beautiful and colourful plant borders. Developing outreach materials (such as a 45 minute film and an exhibition, which was widely shown, based on the work of the project). The project was completed with the handing over of some extra educational materials to all schools and other educational institutions in Seychelles. Our funding came mainly from the GEF Small Grants Programme and the Environment Trust Fund. PCA worked as a partner with North Island Resort, which is based on a granitic island north of Mahe. PCA provided advice and monitoring services in connection with the island’s vegetation rehabilitation programme, which forms a central part of the mission of the island’s managers. The nature of our relationship changed in 2013 but we continue to give advice and assistance as and when required. The photos show the type of rehabilitation that can be obtained on the coastal sand flat using native species - above an area photographed in early 2006; below the same area taken from the same position in early 2011. Much maintenance is required in the early years! The Port Glaud/Port Launay mangrove area is the largest remaining example of this habitat in the granitic islands. It forms part of a RAMSAR-designated wetland site in the West of Mahe. PCA was instrumental in developing a management plan for this area of mangrove, as part of a GEF-funded project coordinated by Sustainability for Seychelles (S4S). The mangrove will be co-managed by the Department of Environment, Constance Ephelia Resort and the local Port Glaud community. A further project is planned, in which PCA will play a small role in assisting the local community to learn how to monitor the mangrove. Review of Invasive Alien Species (IAS) Control and Eradication Programmes in Seychelles (2009). A report, prepared by PCA members for the GoS-GEF-UNDP Mainstreaming Biodiversity Programme. It reviews past and current IAS eradication practices and evaluates evidence of their effectiveness and efficiency. The report includes both animal and plant invasive species and includes contributions from the Island Conservation Society. Invasive alien species continue to threaten many of Seychelles’ native species and habitats and many methods of combating them have been tried in the past. Control and eradication programmes have been considerably more successful when a systematic approach was taken, including a feasibility study. Cost-effective Techniques for the Rehabilitation of Burned and Degraded Lands in the Seychelles (2009). A PCA report which reviews the current situation in Seychelles with respect to management of burned and degraded lands and outlines international practices in comparable situations. It proposes trials of different rehabilitation methods on the island of Praslin, and these are currently being carried out under a separate project. Plant Conservation Training Course (2007). Conducted by PCA as part of the larger FFEM Project ‘Rehabilitation of Island Ecosystems’ coordinated by the Island Conservation Society. Workshop facilitators were Dr Christoph Kueffer (ETH, Zurich / University of Hawaii / PCA), Ms Katy Beaver (PCA) and Dr Eva Schumacher (ETH, Zurich / PCA). 11 local participants were awarded certificates at the end of the six-day course. IUCN Red List Status of the Endemic Woody Plants of the Inner Seychelles. Mostly carried out between 2003 and 2006 by students from ETH, Zurich (see Overseas connections) in collaboration with PCA members, the various studies built on each other, and re-evaluated the conservation status of many of the native flowering plant species using up to date IUCN criteria. The work culminated in a report: “Suggested IUCN Red List Status of the Endemic Woody Plants of the Inner Seychelles” a Master thesis by Michael Huber and Sascha Ismael (2006), and the results for many of the species were accepted by IUCN.